You can use configuration settings of dhtmlxVault to adapt the component to your needs. Check the list of possible config properties. It is possible to specify the full path for file download via the downloadURL property of the Vault configuration object. The property is used to make the full path to a file on a server, in case the link attribute of the file object doesn't contain the full path. Then the link to the file on a server is built as downloadURL+link attribute of the file object. 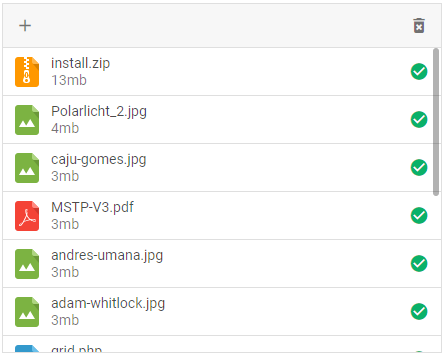 Added files are displayed in a list by default. dhtmlxVault has another mode that displays files in a grid, which is especially useful for uploading images. In the grid mode images previews are displayed in Vault. 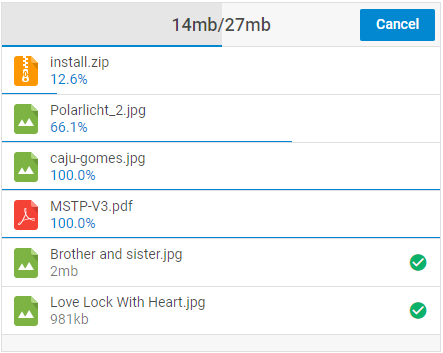 You can view the file size by moving the mouse pointer over the file preview. By default, the value of the mode property is "list". A preview for a file is generated as an HTML canvas image. You can manage the quality of the preview image via the scaleFactor config option. scaleFactor:1 means that a canvas-based image has the width and height equal to 98x98 px. By default the scaleFactor is set to 4, so the size of the canvas image is 98x4=392 => 392x392 px. You can also specify your own preview image for a file with the "uploaded" status in the preview attribute of the file object. Note that if there is no toolbar, added files will be uploaded automatically. By default, files are uploaded to server automatically, as soon as you add them into Vault. If needed, you can disable automatic upload via the autosend property of the Uploader config object. 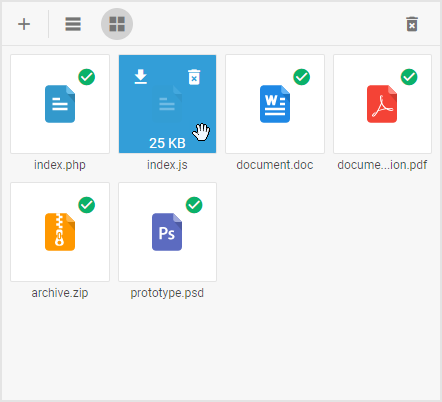 In this case, users will add files into Vault first and then upload them by clicking the Upload button that will appear in the toolbar. You can include additional parameters from the configuration into a request with the params property. For instance, if a user sends several images, files can be collected into FormData and then configuration parameters can be added into FormData. 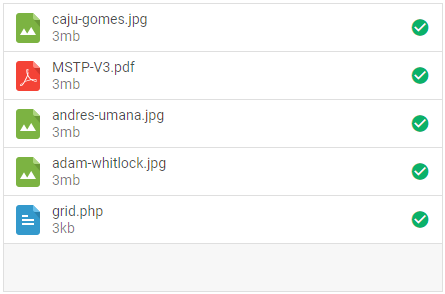 The full list of a file object properties is given in the article Loading List of Files.